(Drum roll please….) Employee tips help detect fraud. The first place prize goes to hotlines. 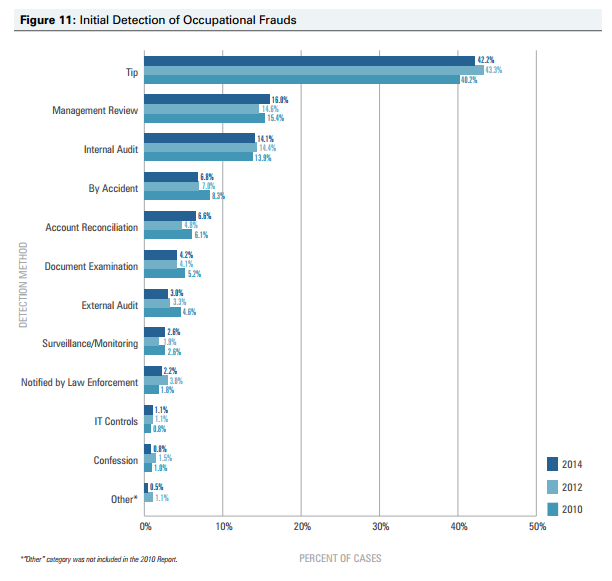 Employee tips account for 40% of all detected frauds and are the #1 method to detect fraud, and that’s a fact! Just go see the ACFEs Report to the Nations if you don’t believe us. Oh, how did these employees bring forth their knowledge of such frauds you ask? Why via a hotline of course. It does not matter the size of business; each needs to allocate resources (respective to their needs) in their anti-fraud measures. But there is one consistent tool – powerful no matter the organization size, type, industry – that even the smallest organization can’t afford not to have (and actually can afford to implement for that matter) and that is the whistleblower hotline. There are so many reasons to implement a whistleblower hotline, aside from what we’ve been blogging about this week. But we encourage you to download this eBook to keep on hand – 25 minute read, full of info. Go get it.